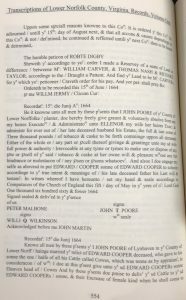 In the difference dependinge betweene Mr John Martin plt. 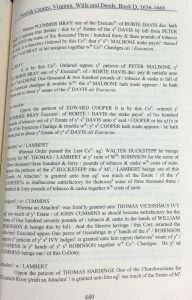 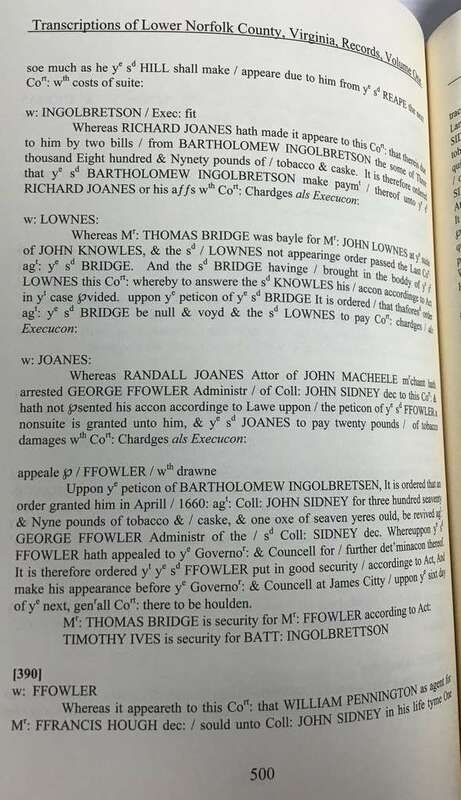 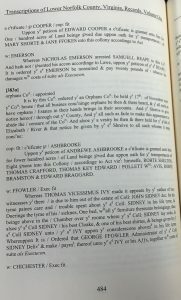 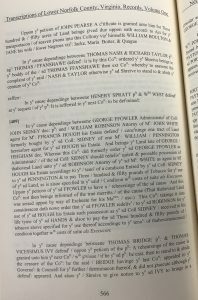 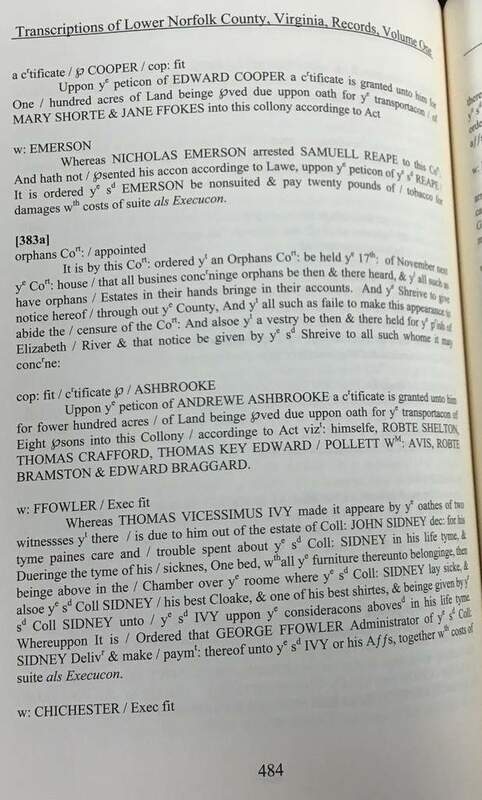 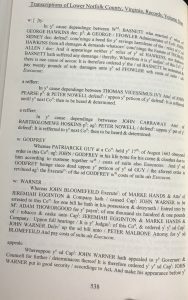 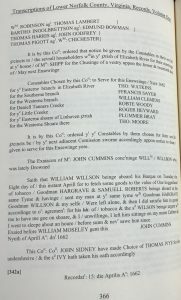 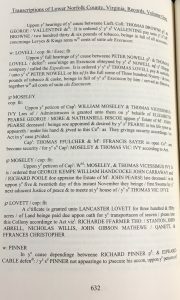 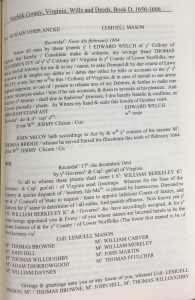 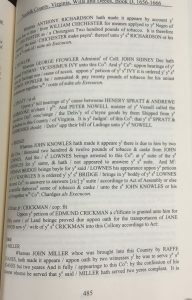 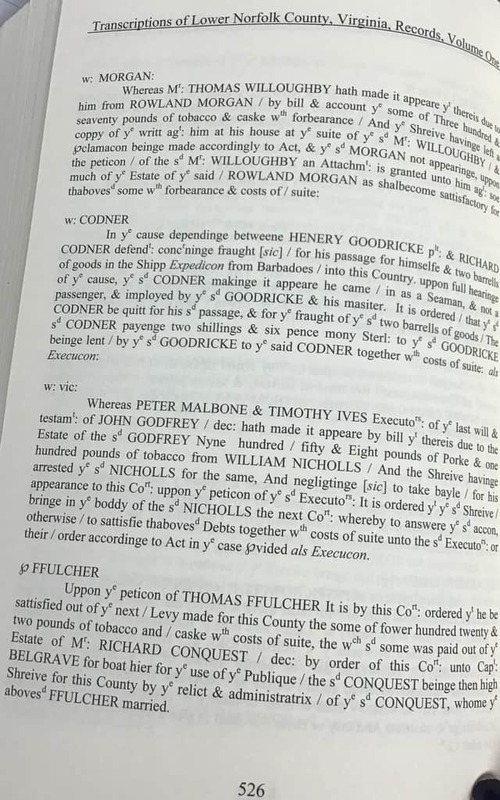 Whereas George FFowler Administ of Coll: John SIdney Dec hath arrested THOMAS/ VICESSIMUS IVY unto this Coll: And ye COrt: uppon hearinge of ye cause & findinge noe / cause of accon. 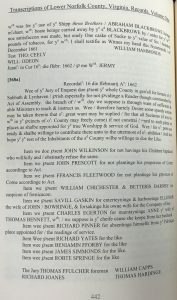 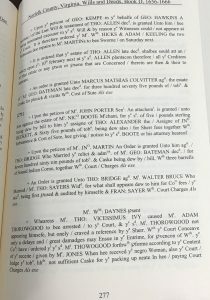 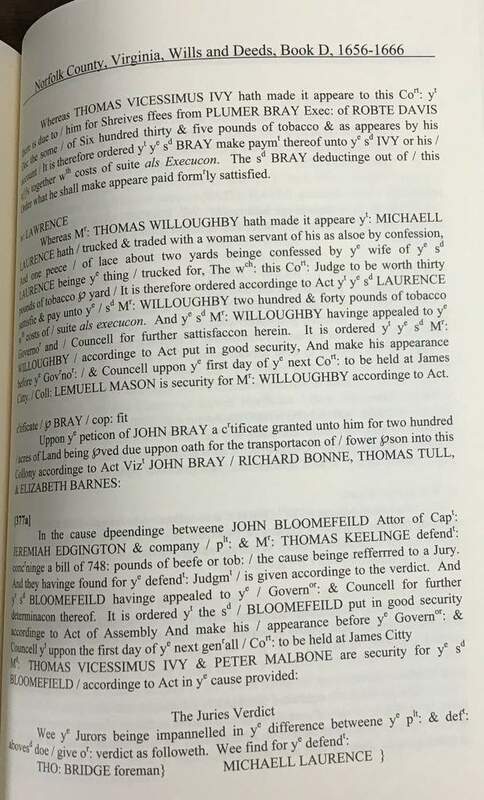 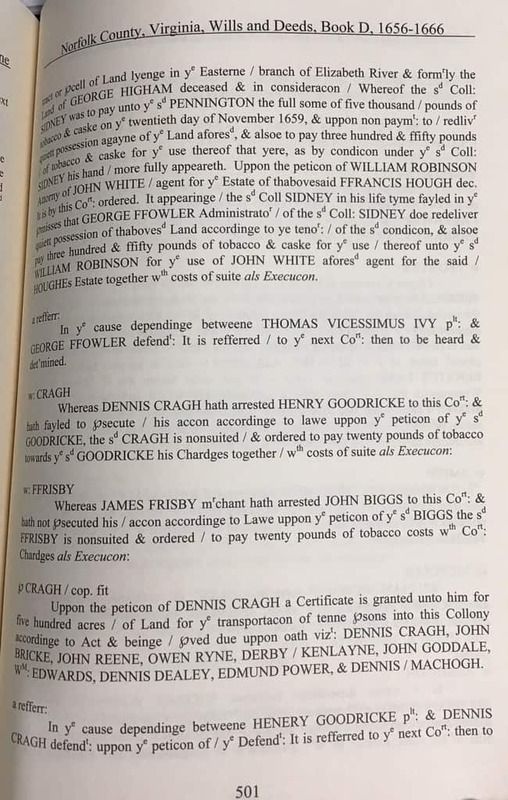 uppon ye peticon of ye sd IVY it is ordered yt ye sd George Ffowler be /nonsuited & pay twenty pounds of tobacco for his unjust moleatacon together with / costs of suite als Execucon. 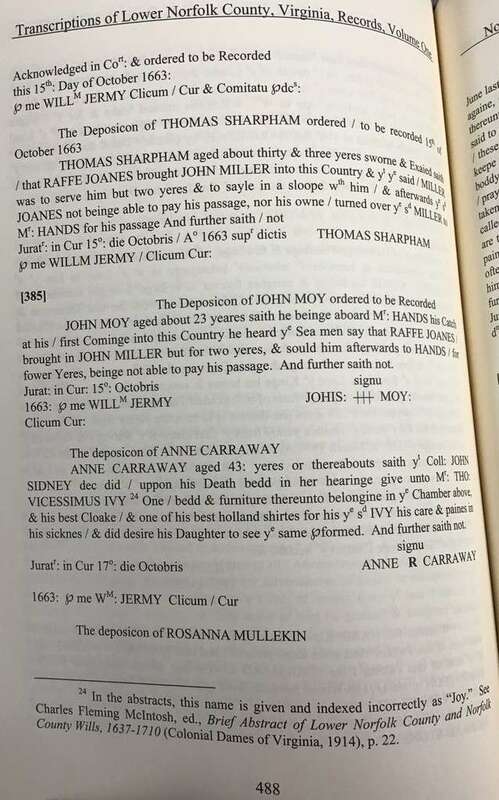 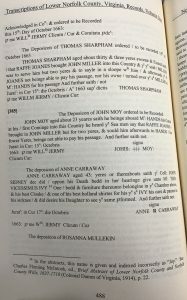 Anne Carraway aged 43: yeres or thereabouts saith yt Coll: John Sidney dec did / uppon his Death bedd in her hearinge give unto Mr: THO: VICESSIMUS IVY One/bedd & furniture thereunto belongine in ye Chamber above & his best Cloake / & one of his best holland shirtes for his ye sd IVY his care & paines in his sicknes / & did desire his Daughter to see ye same pformed. 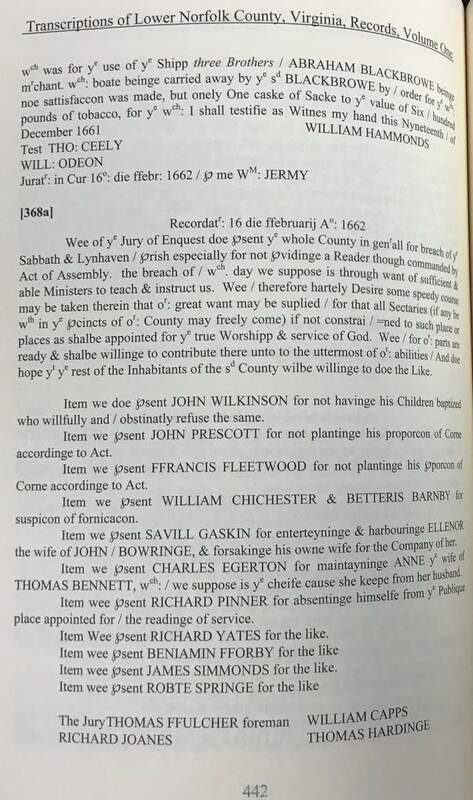 And further saith not. 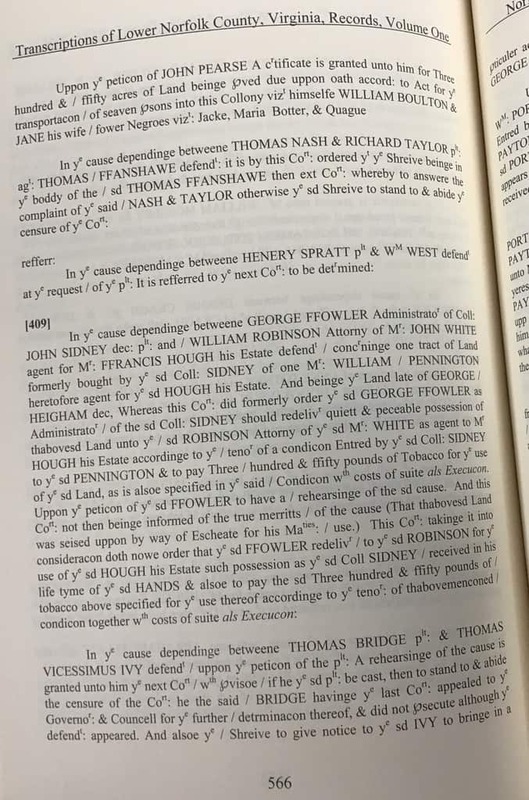 In ye cause dependinge betweene THOMAS VICESSIMUS IVY plt: & George FFowler defendt: It is refferred / to ye next Cort: then to be heard & detrmined. 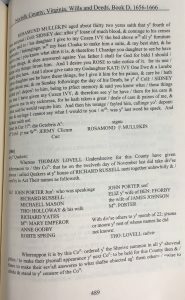 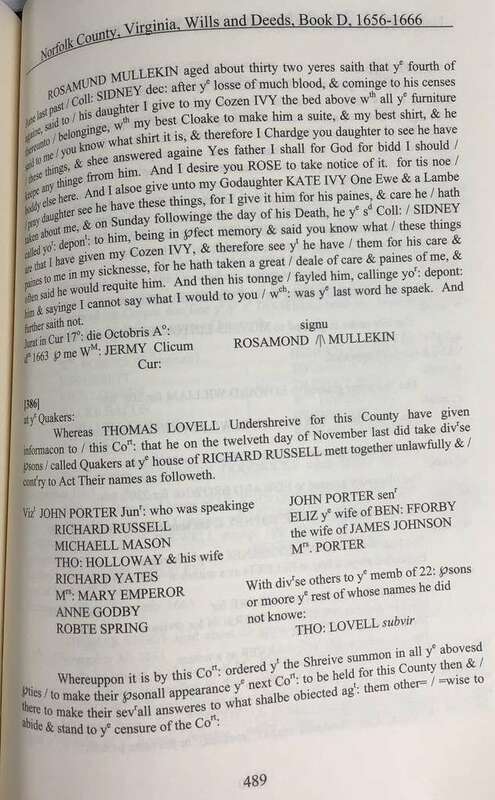 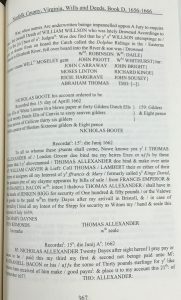 In ye cause dependinge betweene THOMAS VICESSIMUS IVY plt: & George Ffowler defendt: concrninge ye cure of / one horse lately belonginge unto Coll: John Sidney dec: uppon full hearinge of the cause & ye said / Ffowler provinge by oath yt ye sd IVY was sattisfied for ye said Cure of the horse by ye sd Coll: / Sidney in his life tyme. 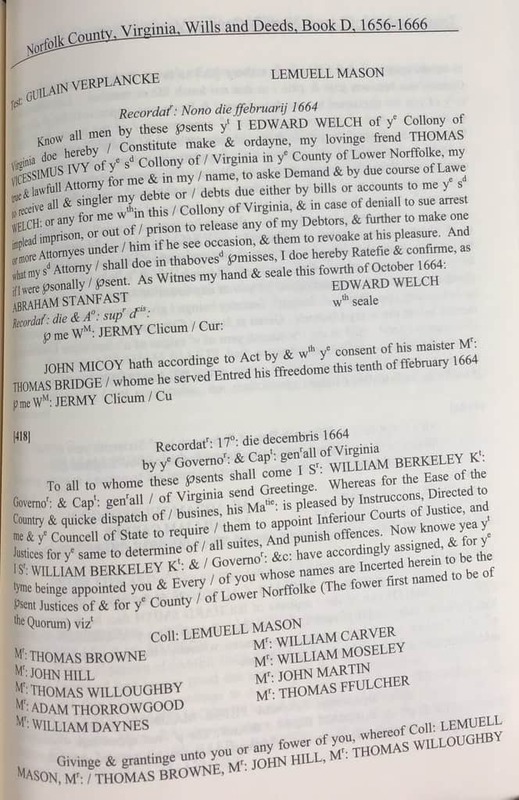 It is the Judgmt of ye Cort: that ye cause be dismissed. 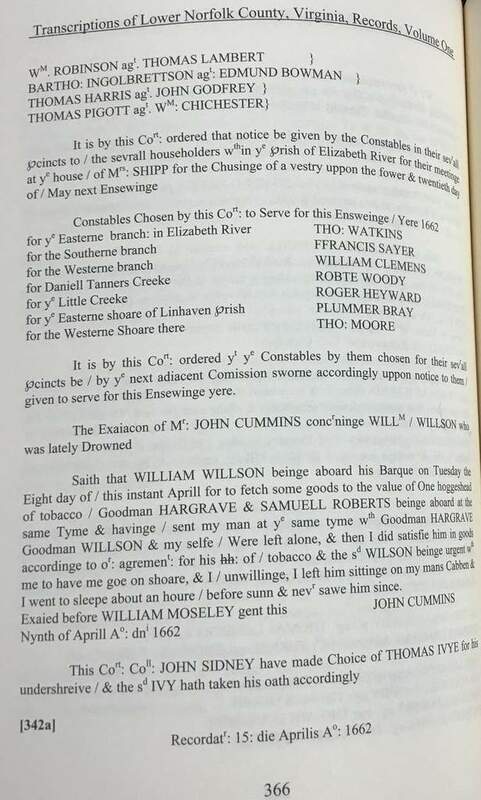 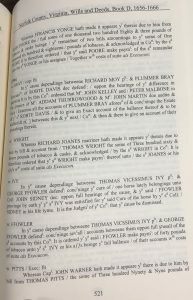 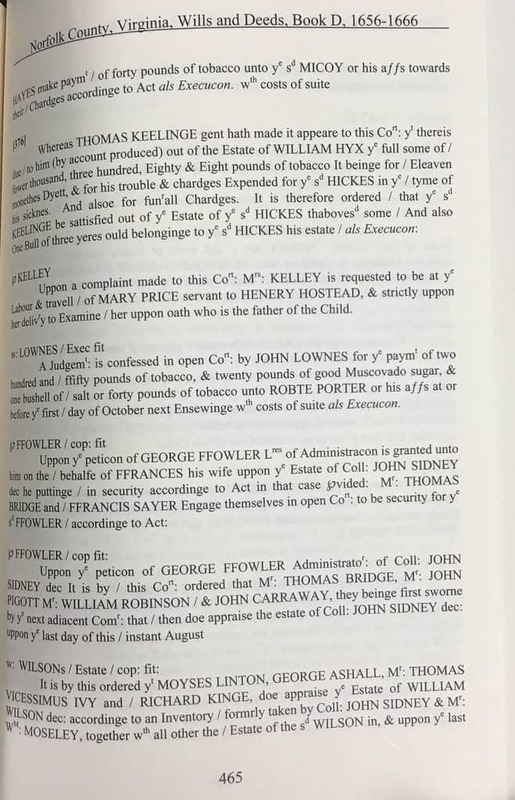 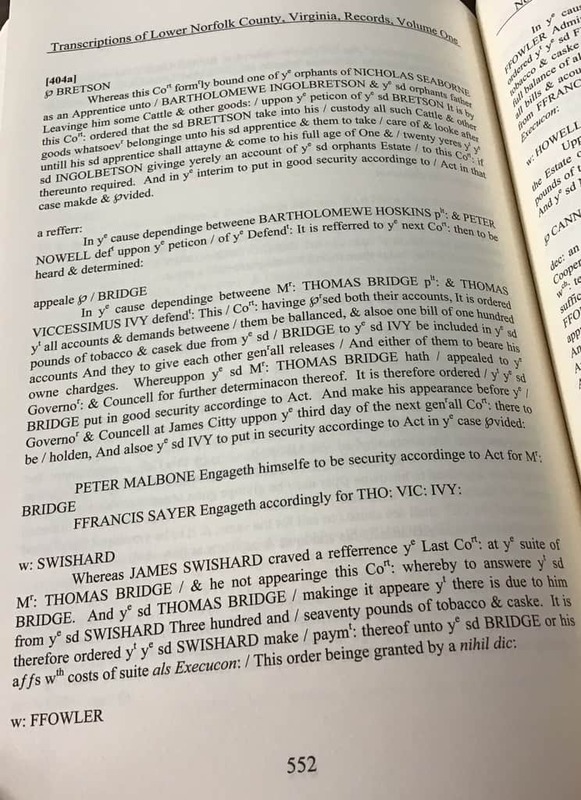 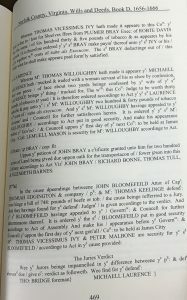 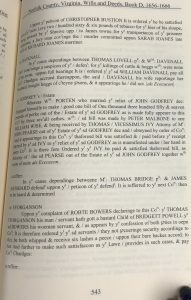 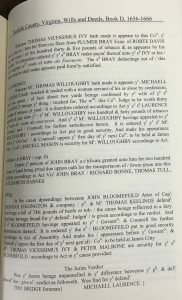 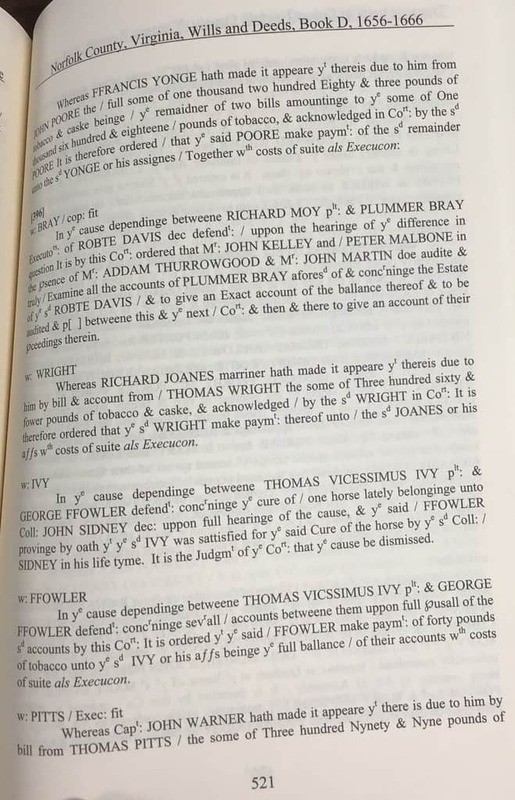 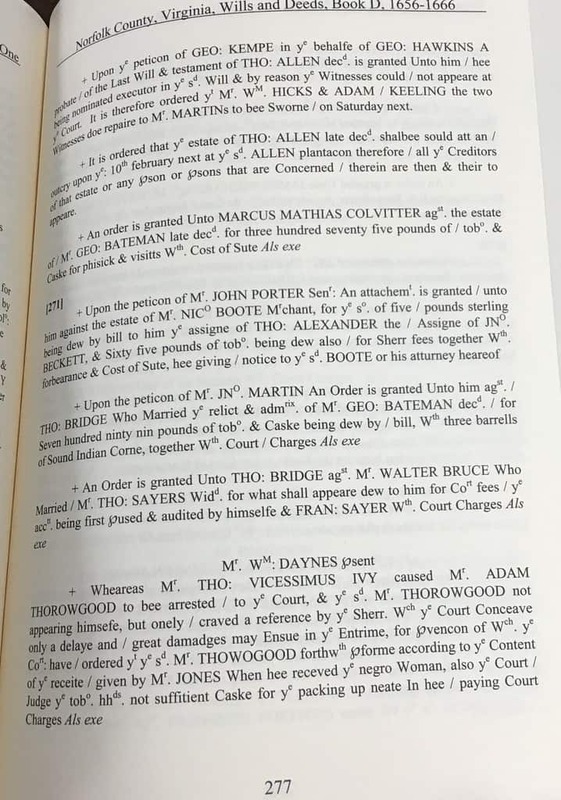 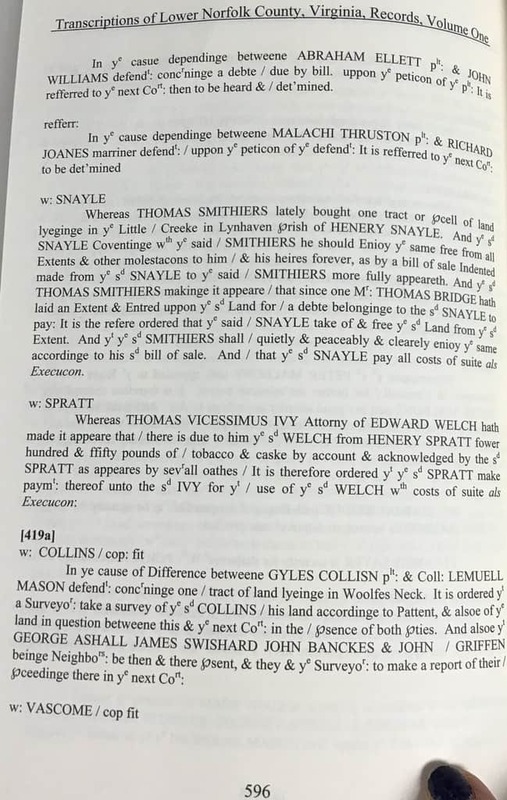 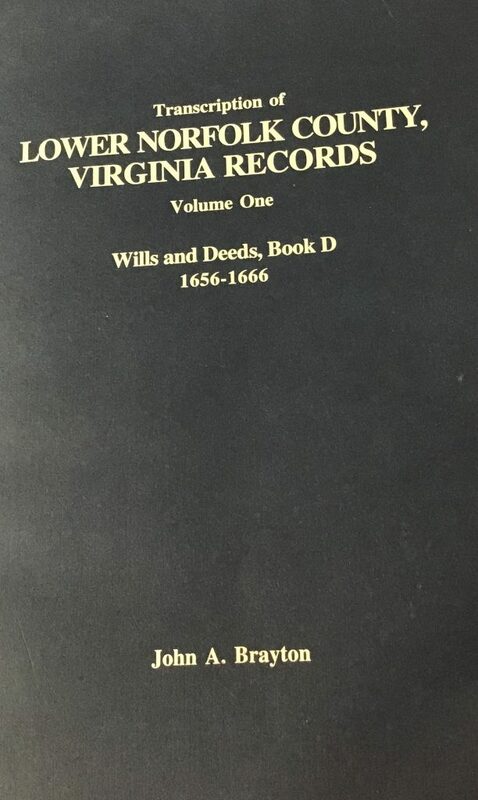 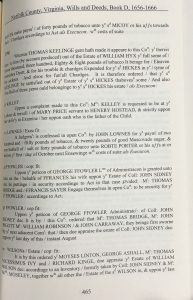 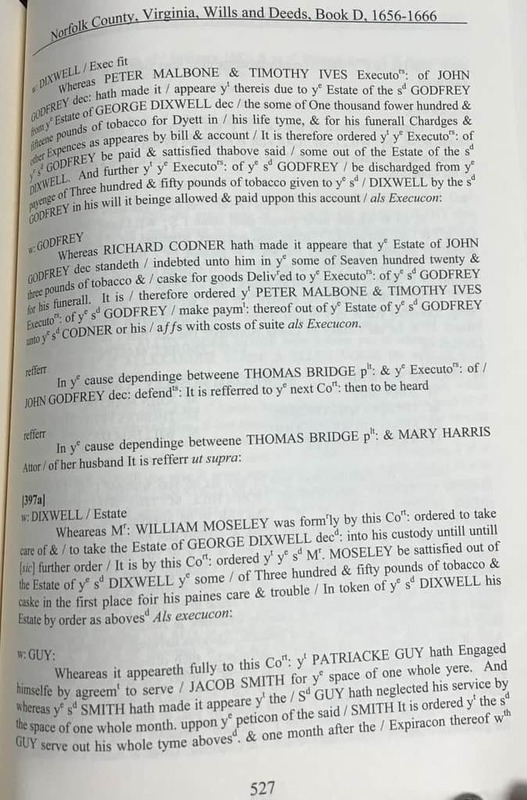 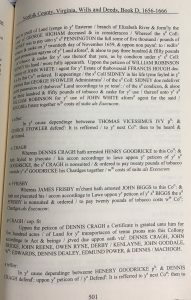 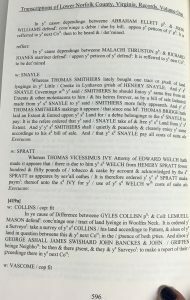 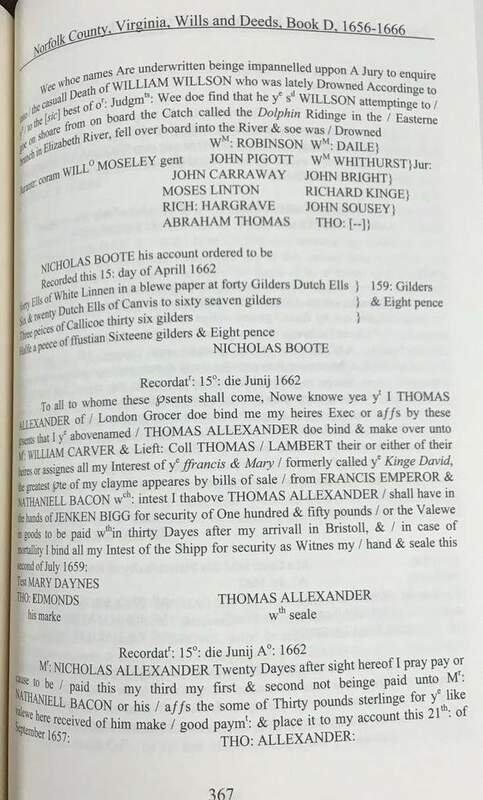 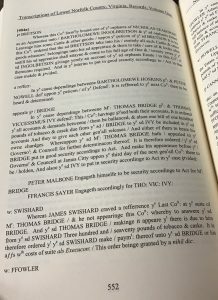 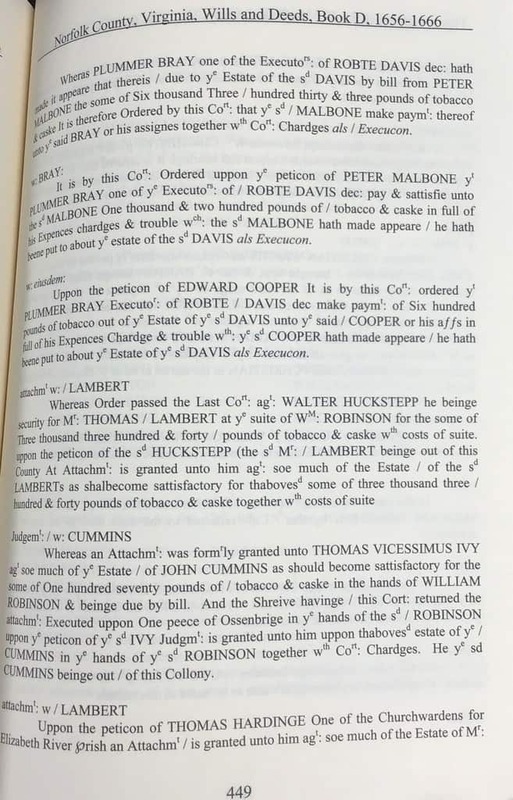 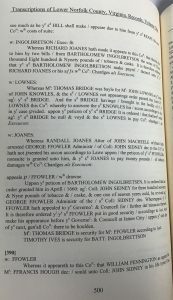 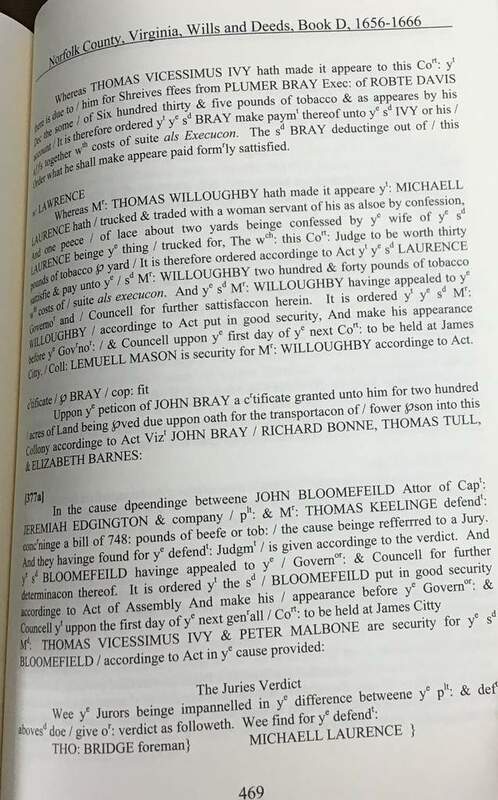 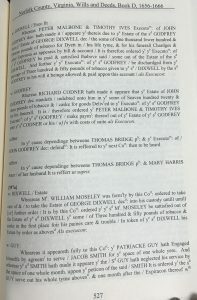 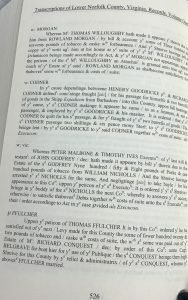 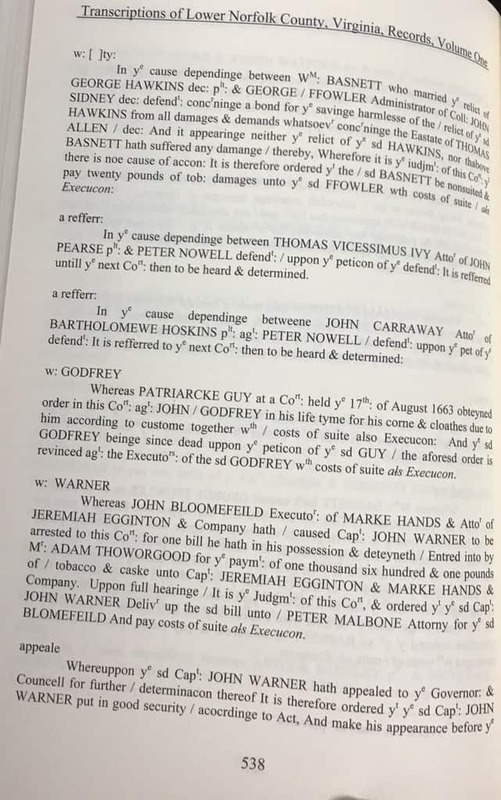 In ye cause dependinge betweene THOMAS VICSSIMUS IVY plt & George Ffowler defendt: concrninge sevrall / accounts betweene them uppon full pusall of the sd accounts by this Cort: It is ordered yt ye said / Ffowler make paymt of forty pounds of tobacco unto ye sd IVY or his affs beinge ye full ballance / of their accounts with costs of suite als Execucon. 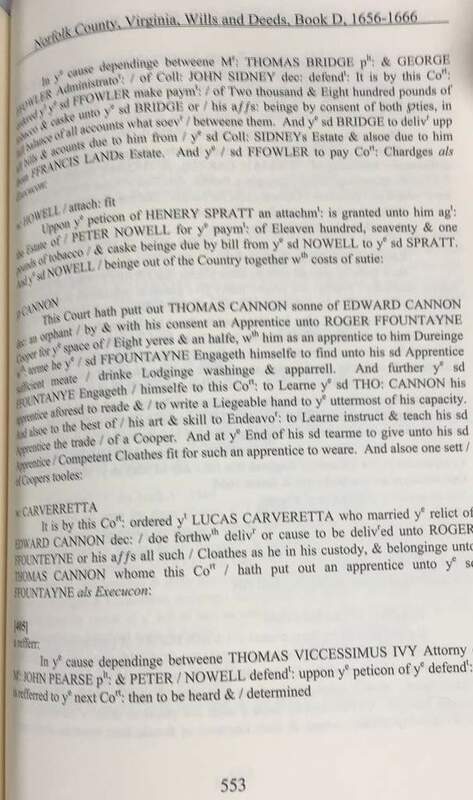 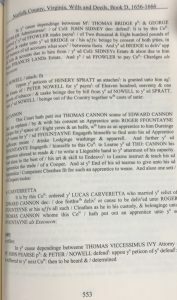 In ye cause dependinge between THOMAS VICESSIMUS IVY Ano of John PEARSE plt: & Peter Nowell defendt: / uppon ye peticon of ye defendt" It is refferred untill ye next Cort: then to be heard & determined. 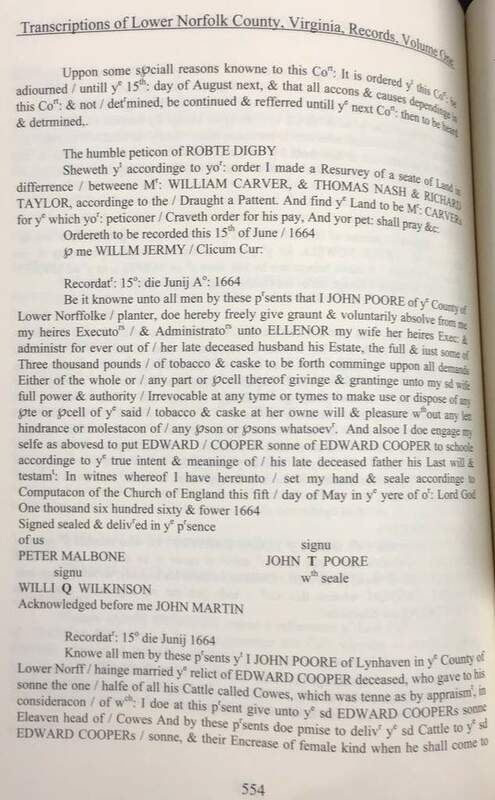 Uppon some speciall reasons knowne to this Cort: It is ordered yt this Cart be adjourned / untill ye 15th: day of August next & that all accons & causes dependinge in this Cort: & not / detrmined by continued & refferred untill ye next Cort: then to be heard & detrmined. 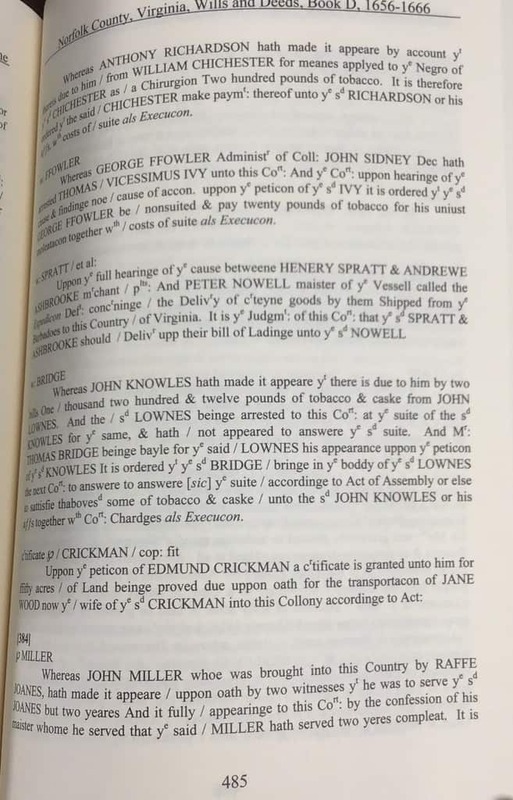 Uppon some speciall reasons knowne to this Cort: It is ordered yt this ort: be adjourned / until ye 15th day of August next & that all accons & causes dependings in this Cort: & not / detrmined, be continued & refferred untill ye next Cort: then to be heard & detrmined. 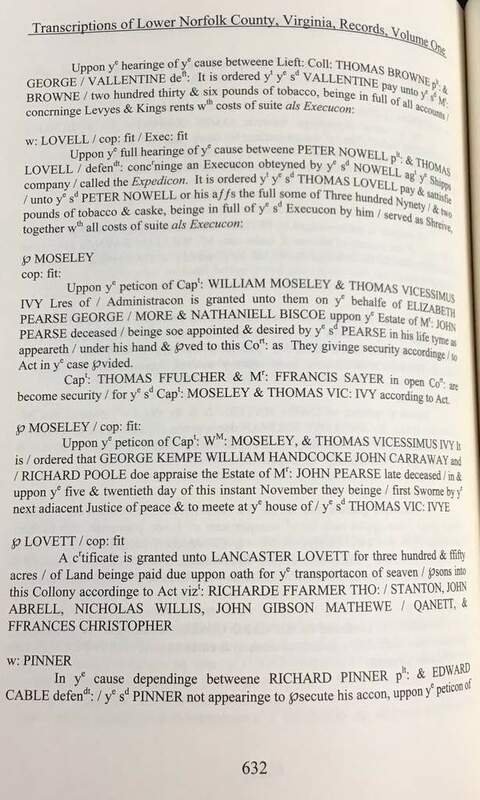 Capt: Thomas Ffulcher & Mr. Ffrancis Sayer in open Cort: are become security / for ye sd Capt: MOSELEY & THOMAS VIC: IVY according to Act. 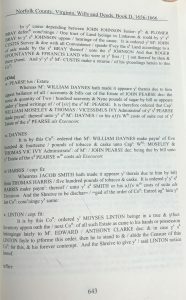 Whereas Mr: William Daynes ... out of the Estate of JOHN PEARSE dec: the some & quantity ... the sd Mr: PEARSE. 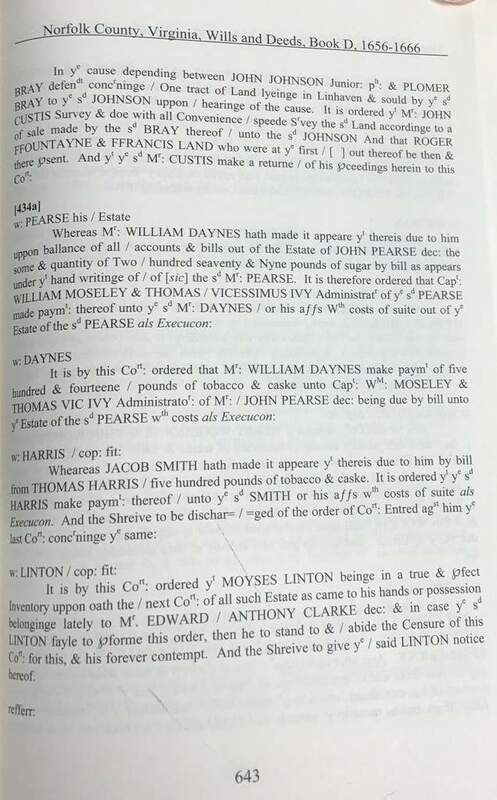 It is therefore ordered that Capt: WILLIAM MOSLEY & THOMAS / VICESSIMU IVY Administratr of ye sd PEARSE made paymt: thereof unto ye sd Mr: Daynes / or affs With costs of suite out of ye Estate of the sd PEARSE als Execucon.